If Arnold Friberg were Japanese and lived in Japan he would be considered a National Treasure, officially designated by the government and revered by the populace. If he were French he long ago would have been made a Commander in the Order of Arts and Letters. Although Friberg is neither Japanese nor French, he enjoys an international popularity. His art and illustrations have been reproduced millions of times and been seen and admired by people living in scores of countries and speaking many languages. . . The subjects of Friberg’s art have been many and varied, ranging from calm, pious religious scenes such as the Nativity, to ferocious Indian attacks on a railway train, to panoramas of forest-fire fighters, to depictions of the Four Freedoms of World War II, to football heros. He has painted Queen Elizabeth and her horse from life and a praying George Washington at Valley Forge from heart. Although born in Winnetka, IL, Arnold Friberg grew up in Arizona, where his parents were converted to the Church of Jesus Christ of Latter-day Saints. Like my paternal great grandparents, they were born in Sweden and Norway. From my experiences in Norway and Sweden I am willing to crawl out on an unscientific limb. I think Arnold got from his Swedish side a sense of artistic organization and completeness. He was very big on what he called composition. Space on a canvas or piece of paper was a challenge to him. He wanted to fill it, but he had the esthetic sense and the self-discipline not to just fill in the blanks. A piece of Friberg art is loaded with details – very authentic details. You would be hard pressed to find something in a Friberg painting that does not belong there. And you would be equally hard pressed to think of something which should be there but isn’t. From his Norwegian side he got tenacity. I must be careful. Tenacity is sometimes a code word for stubbornness. He was insistent on the exact nature of the frames he wanted for his art. He was relentless about the quality of the reproductions of his paintings. He clashed with people who wanted to alter his art or have him make changes which he deemed unnecessary or didn’t like. The late Truman Madsen said that every person is a genius at something and a klutz in something else. Despite Arnold’s ability with a brush, there was at least one occasion when his manual dexterity was a little klutzy, an incident which took place in Buckingham Palace. Arnold lived there for six weeks while he was painting the portrait of Queen Elizabeth II and her favorite horse. This was a royal command. Of course he let her load the camera, and he told me he was much relieved. How did a Utah artist get a studio in Buckingham palace–twice!? Let me retrace some steps. Even as an infant, Arnold felt compelled to draw. He was destined to be a visual teller of stories. From Arizona, Friberg went to Chicago to study art. There he began his career as an illustrator. He produced magazine covers for national magazines, story illustrations, and other commercial art. In 1937 he produced his first painting about the Royal Canadian Mounted Police for the advertising of Mountie printing paper made by the Northwest Paper Company in Minnesota. This is the place where I should put the Queen Elizabeth story into context. The incident is an outgrowth of Friberg’s association with the Mounties. The many exploits of the RCMP are glued indissolubly into the Canadian soul. They constitute a national folklore in the best sense of the term, and Friberg’s paintings bring a lump to the throat, a quickening of the pulse, and a sigh of admiration. Queen Elizabeth came to Canada in 1973 for a summer-long tour. The Mounties were celebrating their centennial. Traditionally the Mounties have provided special horses to the crown. Because everyday Arabian horses cannot hold up under the rigors of police field work, the RCMP has developed a breed that is one-eighth heavy workhorse. The queen was offered her choice of horses and chose one name Centennial, which she changed to Centenial, spelled with one n. The next year the RCMP commission Friberg to paint His Royal Highness Prince Charles on Centenial. The painting was intended for the Prince of Wales Northern Heritage Center in Yellowknife, Northwest Territories. Friberg was given a studio in Buckingham Palace, where he worked for six weeks (although he lived off premises), making sketches, taking photos, gathering information. His passion for exact detail is legendary. Everything about the prince and the horse had to be absolutely authentic. He did the actual painting back in Utah. The painting was not quite finished on schedule. The Mounties arranged for a truck to bring the big painting to Yellowknife, where it was dedicated. Arnold and the Prince had some quiet private conversation and laughs over the fact that parts of the painting were not completed. After the Royals had left, the painting was quietly hauled back to Salt Lake City and finished. Eighteen years later Arnold was asked to paint a portrait of the queen herself, with another RCMP gift horse. Friberg was given a studio in Buckingham Palace, and this time he lived in the palace for six weeks. This is the time of the film-loading excitement. 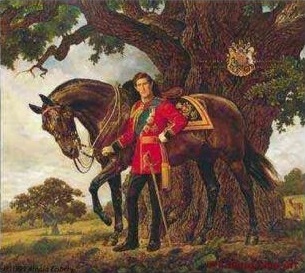 The completed double portrait – of queen and her new horse – remained in Arnold’s hands and is part of the estate which should be in a museum. 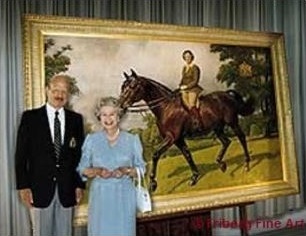 Arnold Friberg with Queen Elizabeth II posing in front of his painting of her on her favorite horse. The renowned figurative sculptor Avard Fairbanks, the first dean of the new School of Fine Arts, University of Utah, about whom I have previously written, persuaded Friberg to leave San Francisco to teach art at the university. Fairbanks, who did double duty as a professor of anatomy in the medical school, insisted that artists should be experts in human anatomy. Friberg was just as insistent that any depiction of a horse be anatomically perfect. And he painted a lot of them–the RCMP pictures, Western lore of all kinds, Washington’s horse at Valley Forge. He admired painters who could capture both the physiology and the character of a horse, but he felt there were very few with the gift. In his view, most artists could not. Friberg looked back to Diego Velásquez (1599-1660) as the great master horse painter, and he enjoyed studying his works in the Prado Museum, Madrid. But Friberg painted scores more horses than the Spaniard, and no one ever painted them better.